This giveaway is now closed. The winner is hjm. Congrats! I recently had Will’s 3rd birthday party at my house. I always like to include a pasta salad with whatever we serve for his summer birthday parties. I’m always in the market for something quick and easy, since the kids are underfoot when I’m cooking. I like potato salad a lot, but it takes way to much time to make. That’s where Betty Crocker’s Suddenly Salad mixes come in handy. You can easy whip up a great pasta dish in the time it takes to boil pasta! (Seriously!) Each box of Suddenly Salad comes with ready-to-cook pasta and a seasoning packet. You can either just leave it like that or put your own spin on it by adding your choice of mix-ins to create a one-of-a-kind pasta salad that will wow your guests. With seven different flavors, including new Greek, you’re sure to find a family pleasing favorite that no one will ever guess isn’t made from scratch! I served the new Suddenly Salad Greek flavor, and we literally had one spoonful left! I would say that it was a hit! Visit www.SuddenlySalad.com. There, you’ll find great recipes, including one for Greek Tossed Pasta Salad which uses Suddenly Salad Caesar pasta salad mix and Garden Ranch Pasta Salad which uses Suddenly Salad ranch & bacon pasta salad mix. Tell me which Suddenly Salad recipe you’d love to try! Good luck! This contest will end July 2nd, 2010 at 12:00 PM CST. Betty Crocker provided me with a prize pack, information, and giveaway through MyBlogSpark. Uncle Bens: Rice Is Back! Up to this point, my family and I weren’t rice eaters. Well, actually everybody but me. However, rice intimidated me. My husband would buy a brand other than Uncle Bens, and we always seemed to screw it up. 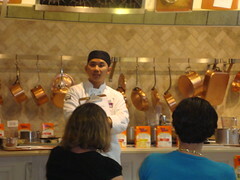 However, I went to the Uncle Bens event here in Chicago to learn, and learn I did! There is a flavor for everyone! My favorite flavor is the chicken one! I’ve reintroduced this staple into my family, and you should too! 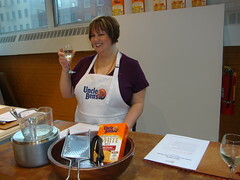 I wrote this review while participating in a blog tour campaign by Mom Central on behalf of Uncle Bens and received the product necessary to facilitate my candid review. In addition, I received a gift card to thank me for taking the time to participate.